CHARLESTON, W.Va. — Tempers flared at the West Virginia Capitol on Tuesday when protesters needled a D.C. political entourage in town on a “listening tour” regarding the pending replacement of the Affordable Care Act, leading to the arrest of one Charleston man. Protesters, including Perry Bryant (right) of West Virginians For Affordable Healthcare, stand outside a conference room where HHR Secretary Tom Price and other officials were meeting at the Capitol Tuesday. Health and Human Services Secretary Tom Price and Kellyanne Conway, special counsel to President Donald Trump, entered the Capitol with local politicians and immediately took heat from a group of activists wielding signs critical of the American Health Care Act, the ACA’s potential replacement. Daniel Ralph Heyman, 54, jostled with Price’s security detail while trying to ask a question regarding coverage for those with pre-existing conditions, Capitol Police officers arrested him and charged him with willful disruption of governmental processes. “The above defendant was aggressively breaching the secret service agents to the point where the agents were forced to remove him a couple of times from the area walking up the hallway in the main building of the Capitol,” the criminal complaint states. After he was released on bond late Tuesday from South Central Regional Jail, Heyman told reporters at a news conference called by American Civil Liberties Union of West Virginia that he was “trying to do my job” when he asked Price if domestic violence would be considered a pre-existing condition under the ACHA. Heyman said he works as a reporter for Public News Service. He said no one who identified themselves as Secret Service or police asked him to leave the area. He said a person he thought may have been an aide to Price told him he “probably shouldn’t be there” and he asked why not. The protesters didn’t stir up much more commotion because they were not allowed to attend a news conference in the Governor’s Reception Room, although one protester repeatedly tried to insert a sign under an auxiliary door. DHHS aides used their feet and a purse to block the crevice. Despite the protests, each politician spoke for a few minutes and Price took four questions regarding the health care bill passed by the U.S. House of Representatives on Thursday. Although Trump has made repeated promises in office and on the campaign trail not to cut Medicaid, Price, side-stepping a question, said that even though the AHCA will drastically cut Medicaid funding, Trump has not gone back on his promise. “No, I think the important thing to think about with the Medicaid system is that, for so long in this country, we judge programs from Washington by how much money is coming out of them into the program instead of the outcomes,” he said before going on to explain how the dollars could be better spent elsewhere. According to the Congressional Budget Office, a nonpartisan governmental organization that assesses the financial impact of legislation, the original version of the bill would slash Medicaid spending by $880 billion. The House passed the newest version without a CBO score. He denied requests for comment as he exited the room. Although the House passed the AHCA in a hurry, most D.C. news outlets are reporting that the Senate will rewrite the bill entirely, and take its time in doing so. Given the Republicans’ two-seat majority in the Senate, a more moderate, nuanced final product is likely. West Virginia’s senators, Democrat Joe Manchin and Republican Shelley Moore Capito, said they have concerns with the bill and will be working to reshape it over the coming months. The bill passed by the House allows states to opt out of certain provisions, including a requirement that providers do not charge enrollees with pre-existing conditions anything higher than healthy people. Manchin said he has some problems with the bill, as well. He has long been a proponent of repairing, not replacing the Affordable Care Act. He said he sees several problems with the AHCA. Among them, he said, the bill does not provide nearly enough funds to cover a high-risk pool of enrollees with pre-existing conditions. Coupling the high-risk pooling with deep Medicaid cuts, Manchin said the bill could pose serious problems for West Virginia. “If our state goes down the path our congressional delegation sent to us, if that were the final product, then our state gets devastated,” he said. The two also disagree on the funding of Planned Parenthood. Manchin has said he supports the women’s health organization and will vote to fund it with federal dollars, as long as those funds do not go toward abortions. Capito says the money would be better off going to community health centers, which provide the same services, minus abortions. She said she would be OK voting for a bill that defunds Planned Parenthood. Manchin and Capito agreed on one thing, though: the ACA needs to be fixed. Each said the bill doesn’t give young Americans an inexpensive option when they’re healthy and off their parents’ plan. With many choosing to pay the required fine instead of enrolling in a new program, costs concentrate on older Americans with more prevalent health issues. 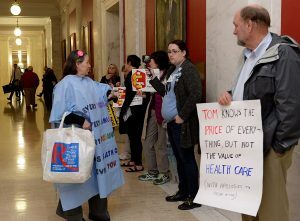 At the state Capitol on Tuesday, many of the roughly 15 protesters were associated with West Virginians for Affordable Health Care and the West Virginia Citizen Action Group. They organized following Monday afternoon’s announcement of Price and Conway’s visit. Protester Kristin O’Sullivan said she survived breast cancer after receiving chemotherapy and radiation treatments under Obamacare. She said that, with three children going through college, she’s terrified of what might happen if her cancer returns and she loses coverage under the ACA. “If I go to my next appointment and the cancer is back, then what’s going to happen? Without Obamacare, I would not survive what I’ve gone through so far,” she said. Valerie Woody, outreach coordinator for West Virginia Citizen Action Group, held up a sign that read “The Price of Trumpcare is too high,” as Price walked past. She said she planned the event to make sure Price knows many West Virginians are not on board with the AHCA. Another protester, Perry Bryant, said he has issues with Medicaid cuts under the AHCA. He said, if the cuts go through, thousands of West Virginians would lose coverage because the state will not be able to fund its Medicaid expansion without federal help. According to figures provided by Capito, 180,500 West Virginians are covered under the state’s expansion of Medicaid through the ACA. However, Bryant said he’s encouraged by a resurgence in progressive activism following Trump’s inauguration, and thinks it will help steer the Senate toward a better plan. Staff writer Jake Jarvis contributed to this report.